Last week, I had the privilege of being invited to help out on my client Harvard Technology’s booth at LightFair 2017 – the world’s largest annual architectural and commercial lighting trade show and conference. This year the event took place at Philadelphia’s Pennsylvania Convention Centre. So, after spending countless weeks and long days marketing the exhibition to potential attendees and editors of key trade publications, I packed my bags and left the Shrewdd office all set for my first experience of the U.S, ready to put my Harvard Technology knowledge into practice. As with marketing, the world of lighting is constantly evolving. 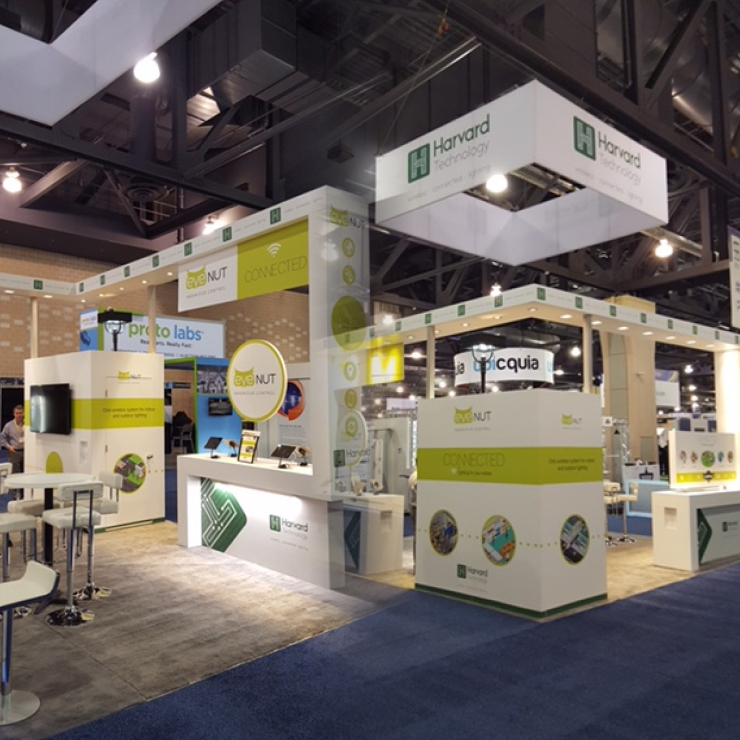 With the theme of this year’s LightFair International exhibition being the Internet of Things (IoT) and Smart Lighting, I was offered the opportunity to travel to Philadelphia to support the launch of Harvard Technology’s market-leading IoT-enabled, remote access, wireless control solution for indoor and outdoor lighting EyeNut to the Americas market. Full disclosure. I am not a lighting engineer by trade. However, Shrewdd Marketing has remained at the forefront of the latest lighting developments over the last five years, developing several innovative marketing campaigns for Harvard Technology and other lighting companies. My role, therefore, with the Shrewdd team has afforded me invaluable experience of LED lighting technology and raised my interest and knowledge in the subject. LightFair International was a prime opportunity not only to polish my familiarity with the Harvard Technology range of solutions but also learn about the latest shifts in the lighting sector. The first thing that struck me about LightFair 2017 was the sheer size of the Pennsylvania Convention Centre venue. Whilst I have attended a number of trade shows before, the U.S. exhibition was a different level. The centre spans the size of three football fields (American Football to the UK readers) and housed 596 exhibitors, across six halls and two stories over the week. There was a time when that space was a quiet and uninhabited place, filled with forklift trucks and half built stands, but as soon as the clock struck 9 am on Tuesday morning and the assembly of attendees streamed through the doors, that was soon a distant memory. This year a record 28,000 attendees from around the globe flooded into the Pennsylvania Convention Center to see the latest innovations and products revolutionising the world of lighting. The result, an extremely busy Harvard Technology stand. Over the next three days, it was fantastic to mingle with members of the global lighting community, from fixtures manufacturers from New Zealand to U.S-based editors and even Canadian reps. It was better still to see such a positive response to the Harvard Technology solutions on show. The launch of the latest version of EyeNut, the innovative cloud-based, IoT-enabled, remote access, wireless control solution for indoor and outdoor lighting, was a huge success – keeping Harvard Technology’s Controls Delivery Lead for Americas, Luis, extremely busy with back-to-back demos over three days. While the company’s first tunable linear system, programmable drivers and Integrated Downlight also ensured the rest of the sales team were busy all week.